I don't know about the rest of you, but this story that supposed Russian thieves have hacked into Murray McCully's emails smell so bad that it bends the realms of credibility. Why the bloody hell would Russian hackers hack Murray's emails and release emails that don't embarrass Murray? Why wouldn't it be something about the Russian NZ Free trade deal? Why were they so keen to point out that they weren't 'Anonymous'? Was it because the computer skills and imagination of whomever stole them wasn't good enough to pretend to be Anonymous and they feared Anonymous might come looking for someone who was pretending to be them? Why the hell would they call themselves 'The Comrades' isn't that like a NZ Hacker group calling themselves 'The Mates'? Isn't 'The Comrades' something someone wanting to identify as Russian would call themselves? Why bring attention to your group? It makes no sense! So many questions and now it turns out the 'Russian hackers' were communicating through a computer with NZ timeline settings??? Doesn't this sound like a scam? 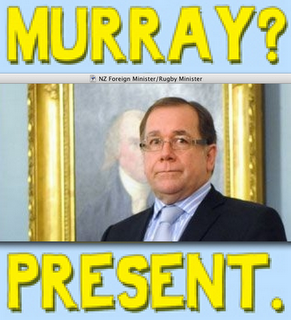 Doesn't the fact all the emails released paint Murray in such a good light suggest it's Murray whose actually releasing them? Kevin Rudd released that footage of himself swearing so that he had an excuse to challenge Julia Gillard for the top job by blaming her for its release, is Murray wanting to smokescreen the fact that he's making 300 MFAT staff reapply for their jobs? That's a lot of angry baby boomers who have diplomatic means to embarrass, will 'the Comrades' release noise in the wake of any actual criticism of McCully? 'The Comrades' are either MFAT staff who are out to embarrass McCully, or they are McCully himself wanting attention on some sleight of hand rather than any real questions as to why he's dismantling MFAT while trying to turn our Aid budget into a source of income creation. Very interesting - I would never have thought of this angle! Now Bomber, you and I both know that McCully is really Elton John, leading a double and quiet life in NZ. The Ronnie Corbett disguise he adds to avoid detection is so ridiculous, we can all see past it!!! Sure would explain the arrogance and lack of professionalism wouldn't it?